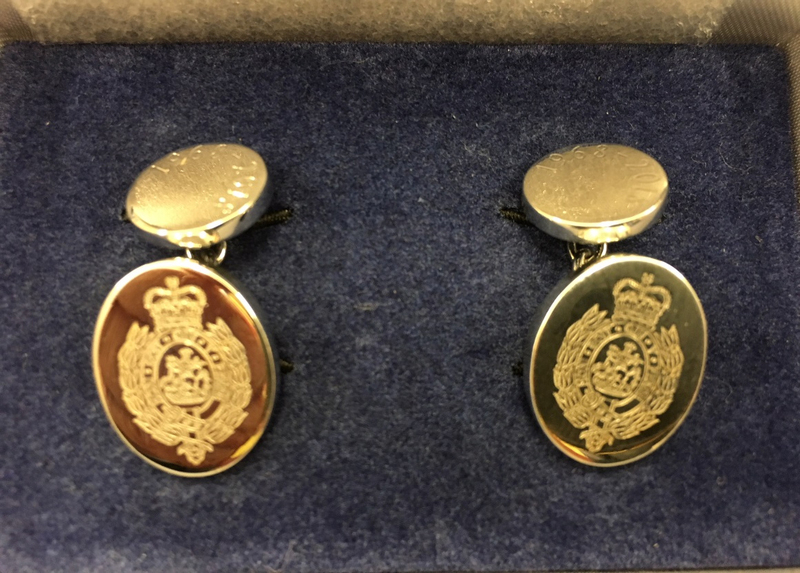 The Fusilier 50 Commemoration cuff links celebrate the 50th anniversary of the Royal Regiment of Fusiliers which was formed on St George’s Day, the 23rd April 1968, from the four antecedent Regiments. Our Sterling Silver hand engraved Fusilier 50 cuff links are the perfect accessory. The Regimental crest is engraved on the large oval and the dates 1968 – 2018 engraved on the small oval. Handmade in hallmarked solid Sterling Silver with a chain link fitting, the exquisite attention to detail is the epitome of understated luxury. Each pair of cuff links arrives complete with a presentation box. The cost is £115 per pair. However, the Fusiliers Association Card will guarantee you a 10% reduction in the price. The first set of cuff links were presented to the Colonel in Chief during the Regiment’s 50th anniversary celebrations on St George’s Day 2018.